If you fish enough, eventually you’ll go home form the lake with a story about the big one that got away. Well, sometimes those stories are the result of fishing without a good landing net. 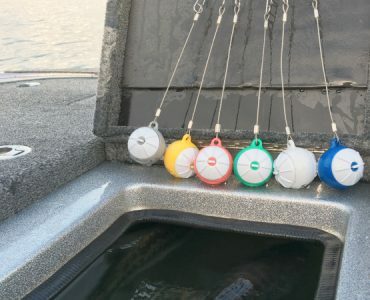 One of the most annoying things in fishing is the loss of a fish right at the edge of the boat – gone, after you’ve put in all the work locating and plotting how to catch them. Many times this situation can be remedied with the right landing net, one that is designed to make it easy to land your specific species, from wherever you prefer to fish. Beyond that, good landing nets protect the fish and aide in catch and release. Coated nets are gentler on a fish’s skin and enhance the success of a fish’s release back into the water. The right net also protects your hands from sharp hooks, and won’t snag the treble hooks on your baits. Below we’ve reviewed the best landing nets, and there’s one for every type of angler and species. There are a few questions you will want to ask yourself that will enable you to buy the right landing net. Where do you typically fish? A net for a kayak will be shorter than on used from a pontoon. And a heavier rubber net used in a bass boat isn’t going to work well in a small fishing kayak. What species do you usually fish for? Trout are more sensitive than catfish or bass, so those nets have smooth webbing and make cradling the fish easier. 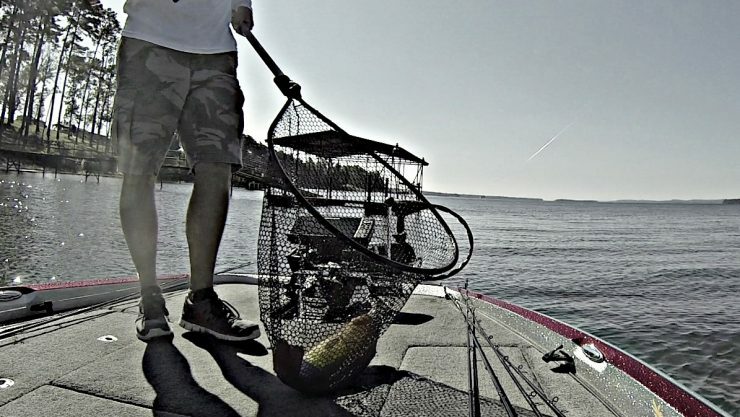 For tougher fish like bass, catfish, and pike you can use rubber coated or rubber mesh nets. EGO S2 Slider (Medium) 60" 19"x17"
EGO S2 Slider (Lg Deep) 60" 23"x22"
Frabill Conservation Series 70" 23"x21"
EGO Reach Crappie Net 102" 18"x14"
EGO Blackwater Trout 24" 15"x10"
EGO S2 Slider Reach (Med) 108" 19"x17"
Frabill Power Stow 72" 24"x20"
EGO S2 Slider Compact 36" 19"x17"
Here are some other important features that will help you decide on the best landing net for your fishing trips. Targeted Species – Each landing net is designed with a target species in mind. There are different designs and sizes for the handle, yoke, hoop, and net material. For instance, the Frabill Power Stow, reviewed above, comes in four different sizes depending on the targeted species; Crappie, Walleye, Bass, or Muskie. Fishing Style – A shorter handle is needed if you are going to fight the fish next to the boat. A longer handle is needed if you will surface the fish and net away from boat. Lake or River – Get longer handles for lake/boat fishing and short handles for river/stream fishing in smaller craft. Boat type – What are your storage options? What is the gunnel height? Material – What is the handle made of? For example: fiberglass composite & chosen wood types can be used for quality in the handle construction. An eight sided anodized aluminum handle will be the most durable, offering strength & weight ratio. Mesh Type – The different types of mesh are also geared towards your target species. Nylon/Coated Nylon – For keepers you fish with a nylon or coated nylon mesh. Rubber – Recommended for catch-and-release fishing. The rubber mesh is soft on the fish’s scales & gills. And does not take the natural slime from fish. Knotless – is lightweight and soft on fish’s scales & gills. It is recommended for trout fishermen and those who prefer river/stream fishing. Mesh Size – A small micro-mesh (3/16 inch mesh grid) is recommended for a delicate fish – like a brook trout. A heavier mesh is recommended for bigger fish. For example: Bass, Walleye, and Redfish. Mesh Bag Depth – Select a depth for your targeted fish that will contain – but doesn’t have lures to get tangled in. Hoop – Hoop design plays a role in the efficient use of the net. For example: A slight scoop on the end of the hoop helps get the fish into the net. The width at the top of the hoop must accommodate the targeted species. Yoke Design – The yoke is designed to add strength to the hoop/handle without compromising the weight of the product. Want to net fish from your boat? The medium EGO S2 Slider extends out to 60” long and collapses to 29” with a push of a button, making it easy to store. The lightweight rubber-mesh is easy on the fish’s skin, making catch and release safe and comfortable. 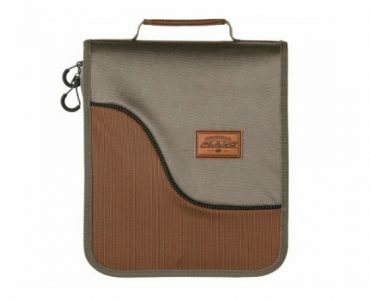 The net bag is 15” deep with a special scoop design making it easier to get fish into the net. And no worries if you drop it – it floats. Winner of the 2010 iCAST Best of Show Award, the EGO S2 Slider remains a gold standard for landing nets. With a bag 24” deep, stretching up to 36” with heavy loads and a flat bottom, the EGO S2 Slider Large is one of the best nets for walleye and bass fishing. 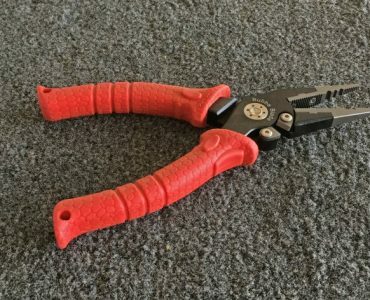 The handle extends from 29” to 60” and is rated for medium to large freshwater or saltwater fish up to 20 pounds fully extended, or 30 pounds fully collapsed. The Frabill Conservation net is a great catch, pun intended, making it one of the best landing nets for bass, walleye, small redfish, speckled trout, and safe for fresh or saltwater fishing. The Frabill has a telescoping handle for that extra reach, even one-handed. Thanks to the cam locking yoke it works great for compact storage. The net material of 100% knot-less mesh netting is gentle on the fish and the tangle free coating is great for the angler – making it easier to de-tangle hooks from the net. 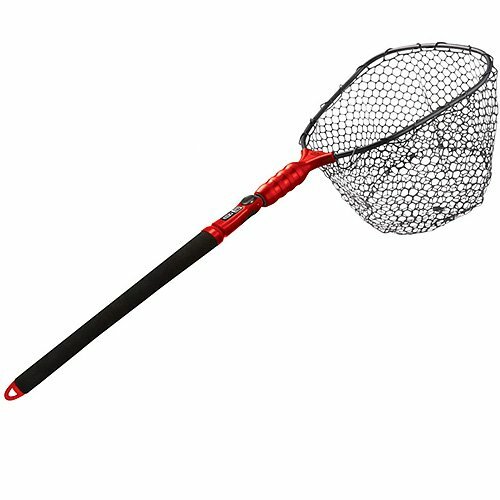 The Magnum Rubber net has a simple and trustworthy design that you can depend on. The handle is telescoping, doubling in length. It pulls out and locks in place on the yoke and collapses for easy storage. The no snag rubber mesh makes it one of the best big fish landing nets. The stretchable rubber design without any rough edges is easy on fish and easy on the anglers who use a lot of hard baits with treble hooks. 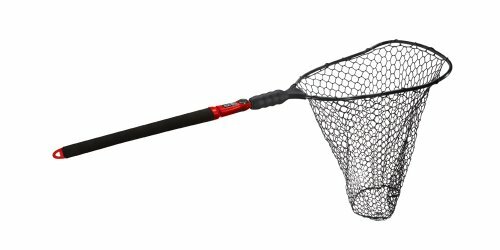 You can scoop up those slab crappies with the EGO Reach Crappie net because it telescopes out to 8 foot and six inches and locks into the desired position. The EGO Reach is designed with a large yet lightweight hoop (18” L and 14” W), and was specially designed to make it easier to land fish using long crappie rods. Whether you troll or jig, a long handled net makes crappie fishing easier and more enjoyable. 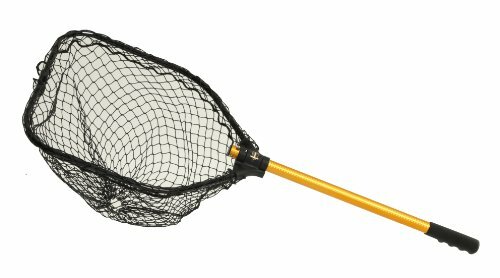 Cabela’s Fold-n-Stow is a completely collapsible net making it one of the most compact and best folding landing nets possible. The handle is made of aluminum and the netting is made of a coated nylon mesh. Two sizes of the Fold-n-Stow are available; one for kayak fishing and the other, which is a larger one, for boat fishing. EGO Blackwater Trout is simply the best landing net for trout. 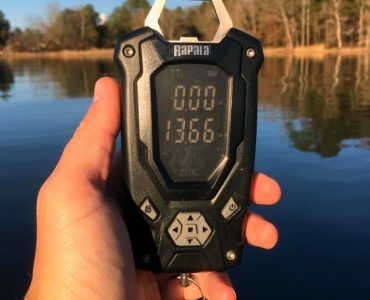 Measure Net technology, a mesh measuring board built into the net, allows you to measure your sensitive trout without it ever leaving the water. 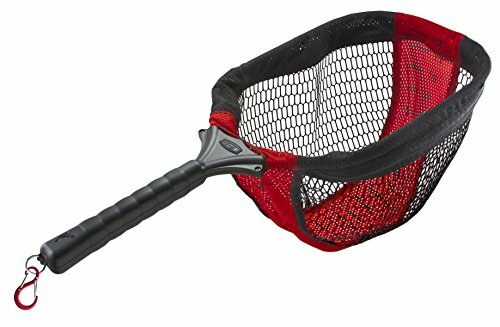 The Blackwater is made with a slip-resistant grip, a retractable Quick-Draw tether to prevent the loss of your net, and the vinyl-coated mesh bag is replaceable with easy zip on and off. Fishing from an elevated position like a pontoon boat, is made easy with the EGO S2 Slider Reach. The 48” handle extends to 108” easily with the push of a button, that’s over double the reach in one easy motion. The padded handle ensures a good grip – wet or dry. The Rubber Mesh net makes it easy for de-tangling hooks – helping anglers make the best of their time doing what they came to do – fish. 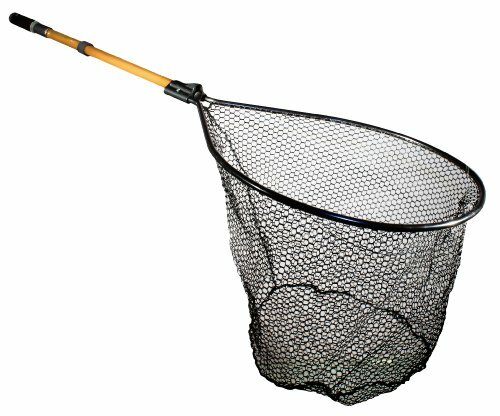 The Power Stow is a folding fishing net that is a little bigger than the Fold-n-Stow. The Frabill Power Stow is designed with a storable, glass-filled nylon yoke, which enables the strength and durability needed for years of use. It comes in four different sizes, one for Crappie, Walleye, Bass, and Muskie. 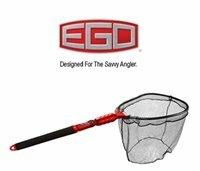 The EGO S2 Slider Compact Landing net is what you want by your side when you are in a canoe or kayak fighting a trophy fish. Keep the handle retracted at 18-inch length for most of your fishing and when you hook a big one, extend the handle to 3 feet to bring it in. The Slider Compact is considered to be the best Kayak landing net for the money.